The roar of Giants fans infiltrated the air as ticker-tape and toilet paper filled the sky on Tuesday, when players invaded the Financial District’s Canyon of Heroes to commend the team’s 2012 Super Bowl victory. 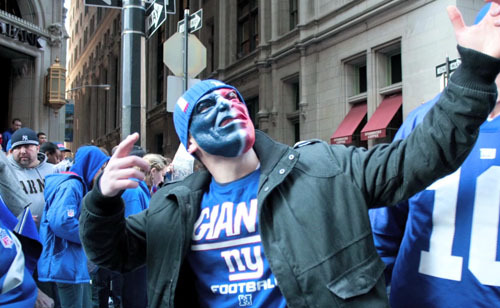 While most parade-goers sported classic jerseys and tees to honor the two-time champions, the New York Giants fairies decided to veer away from the sea of blue. “Other NFL teams have cheerleaders, so we are going to be their official cheerleaders,” said Chernick. Both young and old alike gathered downtown to get a glimpse of their favorite team player. For Brandon Mapp, 11, skipping school to join in the celebration was a worthy holiday. Anthony Bataglia, 8, also didn’t mind playing hooky to take part in his first Giants parade. 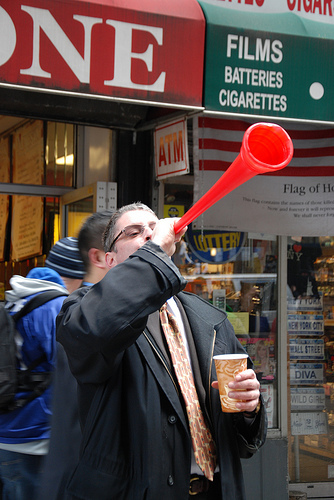 Some fervent fans, like Kevin Quinn of Oakland, Long Island, used vacation time to join in the festivities. Quinn further added that being surrounded by others who share the same love and passion for the Giants is “crazy,” but overall, an experience that cannot be replaced. “Manhattan is ours today,” he said.